Latest news and events from TASC Software. 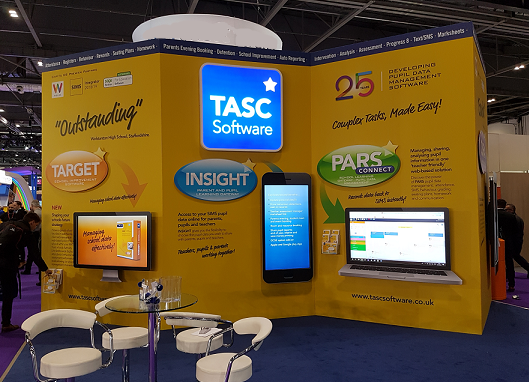 Fantastic show at BETT this year proving TASC Software is still one of the best pupil software companies in the UK. With a new interactive ‘leaflet’ shaped design stand, our bright yellow appearance certainly stood out from the crowd! Feedback from existing and potential customers was extremely positive and grateful reminding us of how our solutions do encompass what schools need at an extremely affordable price in comparison to other software available. We also welcome back one previous school who stopped using INSIGHT 6 months ago moving to another … and after a huge parent revolt; are coming back to INSIGHT. Also another welcome back to an ex PARS customer, returning as the software they switched to, just doesn’t have the ‘power of PARS’. There is not one solution in the UK market that is like-for-like with any of our software. PARS can be underestimated until it has gone. It is not always about the ‘seen’ features that make a solution, it is about the automated interventions that take PARS from good software to an outstanding management software solution. Grant Hughes on helpdesk was ‘let out’ from behind his desk and was warmly met by many schools he has spoken to over the past few years. One customer thought Grant was at least 40 years old…. https://www.tascsoftware.co.uk/wp-content/uploads/2019/01/bett-stand-2019.png 383 530 Jenny Urey /wp-content/uploads/2014/07/TASC-logo-178x178.png Jenny Urey2019-01-30 12:30:402019-01-30 13:59:50What a success!